It’s no secret. I’m a HUGE fan of NaNoWriMo (National Novel Writing Month, or NaNo). The event takes place in the month of November. 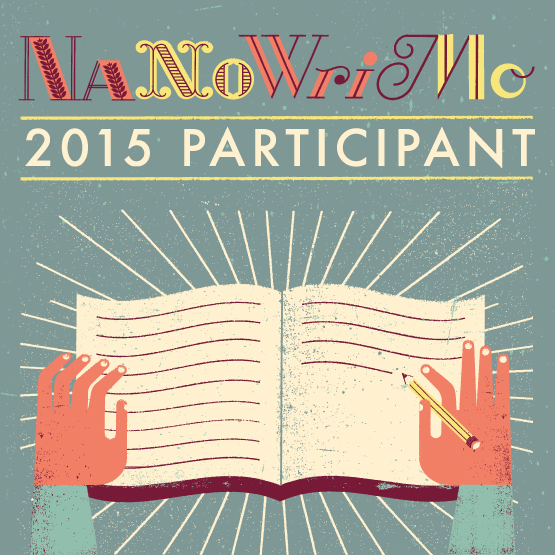 Participants commit to writing a 50,000 new words of a novel in 30 days. In those 30 days, literary madness ensues, fast friendships are forged, barriers are broken, dreams are made realities. Some posts, however, argue that NaNo makes worse literature, that NaNo is bad for writing, that it’s a fad diet that won’t keep the pounds off when you get back to daily life. To those people I say, get out of the way and let people create in whatever way they choose. It’s fine if NaNo doesn’t fit your process. If you need to create in a different way from NaNo, you go right ahead. You do you. But don’t rain on our parade! Now I agree that 50,000 words does not a novel make, but who ever said that the draft you create during NaNo was supposed to be perfect and publishable? Sure there will be problems with sentence structure, plot holes galore, and overused adverbs in those “winning” NaNo manuscripts. That’s what revision is for! NaNo provides inspiration and opportunity for all. People who have always wanted to try writing a novel find motivation, encouragement, moral support, and success through NaNo. You can’t edit what you haven’t written yet, right? I think it’s easy for some people to get so hung up on choosing the right words or expressing their idea in the perfect way that they freeze and can’t write a thing. NaNo can fix that problem. If you have to write 1,667 words a day, you can’t freeze and worry about finding the right words, you just have to write. And spending 30 days regularly meeting a certain word count, whether or not your muse wants to come with you, can unlock your voice in a way that no Creative Writing course could ever do. What better way to get past writer’s block? So you can’t think of what should happen next in your story, but you have 1,667 words to write that day? Grab a writing prompt, a weird little plot bunny that takes you in a completely different direction for the day. Even if you end up not using that day’s words in your final draft, you will have shown that writer’s block that you’re the boss of your writing. NaNo is the perfect time to tell your internal editor to take a hike and make yourself sit down and write every day. The best part is, when you get to the end, you can decide whether the NaNo process does or does not work for you and adjust your writing habits accordingly. But if you’ve been telling yourself that there’s no way you could write every day, much less 1,667 words or more a day, NaNoWriMo is your chance to challenge yourself. At the end of November you might decide to pursue the manuscript and keep working on it, or you might decide to shelve those words and never look at them again. But no words are wasted words! It takes a lot of bad writing to get to the good writing. So pour it all out onto the page and don’t worry. You can edit in December.